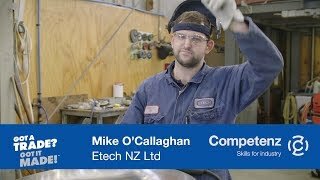 Completing an Outward Bound course was the “opportunity of a lifetime” for Competenz butchery apprentice Kalolo Fale, and the chance to build the ‘soft skills’ that employers in the 37 industries Competenz works with regularly tell us they value. The Competenz careers team regularly advises school students to take the initiative and seek out ways to build these soft skills. An Outward Bound course is a good option, and one that employers regard highly. Jobseekers can gain these skills in other ways too, without scaling a mountain or fording a stream Joining a sports team, doing some voluntary work, or helping run a community event are positive ways for students to show employers they are serious about gaining soft skills, learning new things and being a valuable member of a team. Kalolo, who is in the second year of his apprenticeship with Preston’s Mater Butcher in Wellington, says being sponsored by butchery supplies company Dunninghams to attend the classic outdoor course was a “humbling experience”. As he heads back to work, the 20-year-old says the experiences at Outward Bound have given him confidence and skills that will help him in his workplace. “The three-week Outward Bound really pushed me out of my comfort zone. I learned a lot about teamwork and caring for others. When someone in our team was struggling, we all got together to support them. It was a real lesson in how we can all work together and help each other, both inside and outside of work. “Another skill I developed during the course was being a better communicator. I always struggled with self-confidence and not putting myself ‘out there’. But now I’m more open and not afraid to talk. Kalolo’s work ethic and ‘can do’ attitude saw him win the chance to attend his course. He joins more than 52,000 New Zealanders who have now completed an Outward Bound course. Outward Bound is New Zealand’s leading outdoor education experience. Based in the Marlborough Sounds, the non-profit trust offers life-changing courses for a range of ages and abilities. Courses help participants gain confidence, find resilience, and a new direction in life. Find out more at the Outward Bound website.